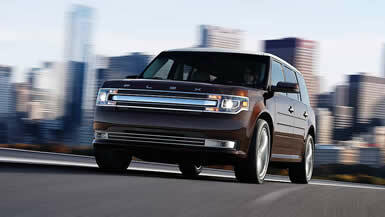 The 2013 Ford Flex Review: The Ford Flex is one nice family hauler, with room for up to seven, if you fold down the third row seats. The fronts are plush buckets, the middle row ditto, and the rears? Well, they fold down invisibly in two halves to make a flat cargo floor, or pop up with the pull on a strap or two. Every passenger gets a sunroof too, with glass and manual shades, over all three rows. Only the sunroof in front opens, however. The Flex gets a new face this year, and it is a surprising design turn. The Ford oval logo is gone! Instead, the letters F L E X are spread across the leading edge of the hood and a solid chrome bar runs through the grille. This new look echoes a general move away from blatant badging on Ford's part. Just wait until the new Fusion appears this fall for another example of this big change. The Flex offers two 3.5-liter engines. The standard one puts out 287 horsepower and 254 lb.-ft. of torque, while the EcoBoost model essentially replaces the old V8 with a robust 365 horsepower and 350 lb.-ft. of torque from the same displacement. Ford is introducing EcoBoost throughout the line over time to get the power folks expect from larger engines using smaller displacements. Select from three grades – SE, SEL and Limited. On top of the SE features, the SEL adds Climate Control, Ford SYNC with MyFordTouch, heated front seats, and more, and gains access to a wide choice of options. The Limited adds leather seating, remote start, LED taillamps, and the other stuff you expect at the top level. My Ginger Ale Metallic tester was an SEL model with all-wheel drive. With the standard engine, it was ranked 17 City, 23 Highway, or 19 Average. I averaged 18.9 mpg, almost exactly what the EPA says. Ford's updated MyFordTouch programmable instrument panel displays are standard in the Flex. You can choose the information you view on the left and right sides of the main instrument panel gauge. I liked looking at fuel economy numbers on the left and the entertainment system on the right, but you can set up other functions using steering wheel mounted buttons. The center console display offers a home page with phone, Audio, Information and Climate quadrants. Touch the inside corner of any section and a full screen display gives you details. The Flex had the first instance I've seen of the new inflatable rear seatbelts for $195. These fatter-than-usual straps inflate when a crash is sensed and give added protection to the torsos of the middle-row passengers during an accident. Beyond the interior’s interface of today, the Flex positively bristles with 21st century technology. You can order option radar-enabled adaptive cruise control and collision warning with brake support and Blind Spot Information System (BLIS®) with cross-traffic alert. These electronic marvels alert you of potential dangers, using radar to detect the relative position of the other cars around you. The system tells you instantly if you’ve got a potential problem, using both visual and audio alerts. The Flex comes with Torque Vectoring Control and Curve Control technology, which is typically found only on high-performance cars. The Torque Vectoring Control system uses the car’s brakes to act like a limited-slip differential, constantly balancing the distribution of engine torque between the front wheels during cornering, resulting in improved grip and steering and a reduced chance of understeer. Torque Vectoring Control is extremely subtle and you may not even notice it working. Curve Control senses when you’re entering a curve too quickly, and can apply four-wheel braking to reduce your speed by up to 10 mph in approximately one second. Perhaps with large, tall vehicles like the Flex this can be an issue. Curve Control helps you follow your intended path, and should be especially useful on freeway on and off ramps. A couple of 21st-century annoyances: With Ford’s SYNC system, I had trouble keeping my phone connected, but this is a common issue in cars with Bluetooth and is still a little unreliable. I also was slightly annoyed when the iPod hookup kept losing the shuffle feature and had to be restarted each time, again, a fairly common situation. The Bottom Line: The 2013 Ford Flex crossover fits in the Ford lineup in between the midsize Explorer and the full-size Expedition SUVs. It has a significantly lower ride height and feels more like a car, which it essentially is. With room for 7, and gas mileage in the 20 MPG range, it has appeal over buying a car, just for it’s extra room, versatility and style. The Flex starts at around $32K and goes up from there, but as a crossover it has some car, van and SUV written all over it, it’s a great looking fun vehicle from Ford.